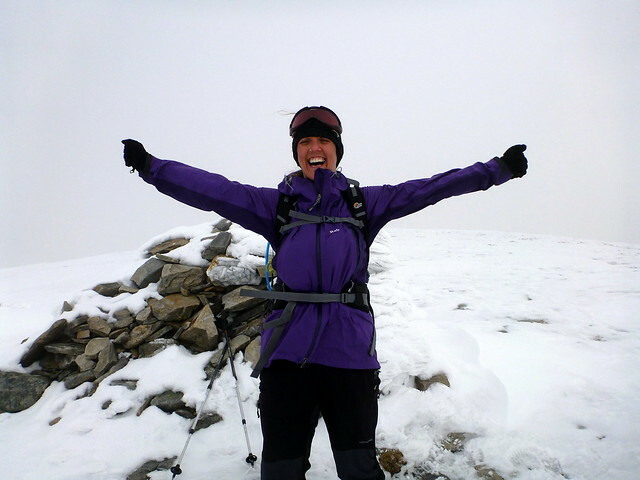 Having spent much of the last week enjoying the flat streets, tasty food and fine wines of Vienna on hols with my wife I was keen to get back out on the hills. The experience of going through Heathrow Airport was not a pleasant one – I could feel the life getting sucked out of me in the entirely artificial atmosphere of that place and needed a natural recharge. 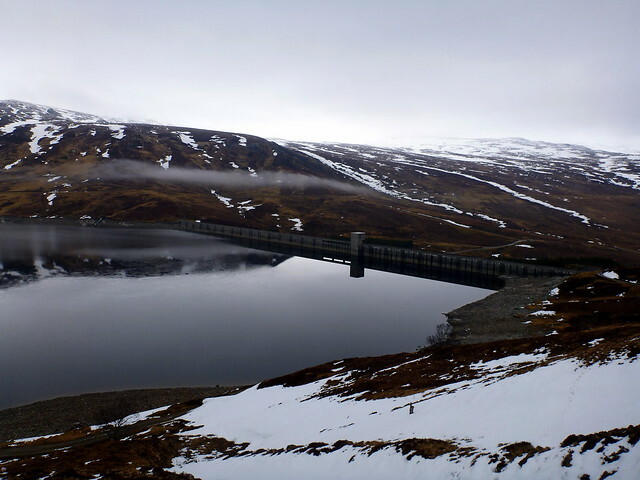 Originally I had planned to do an overnighter and finish off 5 of the Loch Laggan hills that are still to be done, but the weather forecast of “severe gales” on Saturday night/Sunday morning made me reconsider. 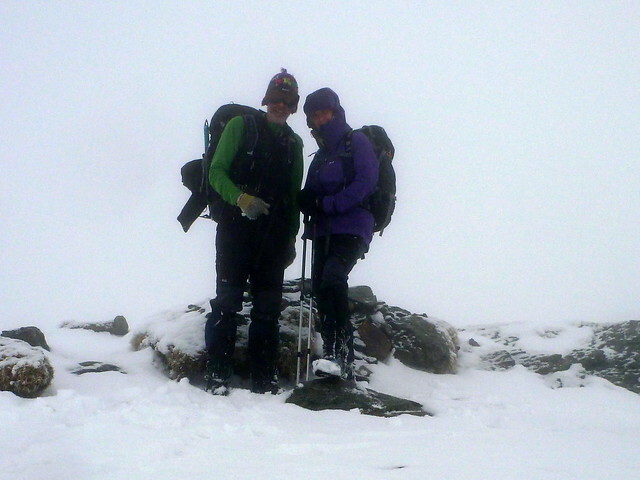 Plus Allison was recovering from some days of ill health and I didn’t want to push her too hard. 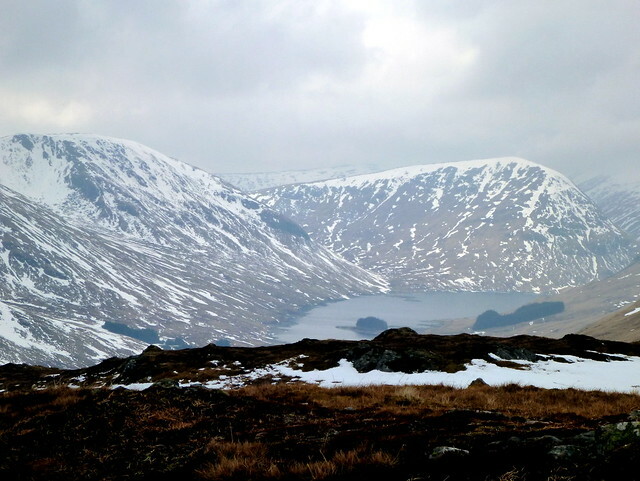 So we settled on the pair of hills up at Lochan na Diamh that we didn’t manage to get to last weekend. 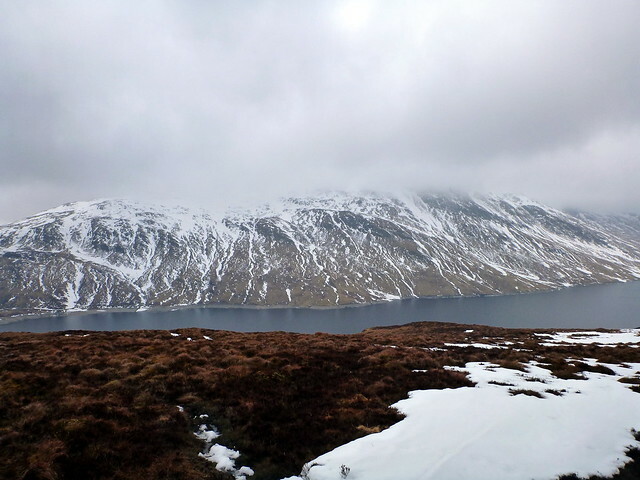 Originally I had planned a circuit of the loch, with a couple of the Corbetts thrown in, but uncertainty about how Allison would manage today plus the thick clag lying along the Stuckd plateau made the quick baggers’ option of doing both from the car park more sensible, if less thrilling. 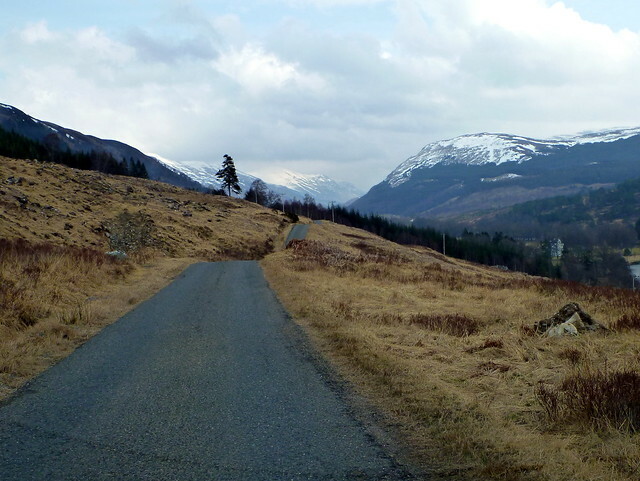 We decided to go the long road round from Fearnan as I reckoned the road from Lawers would still be shut. 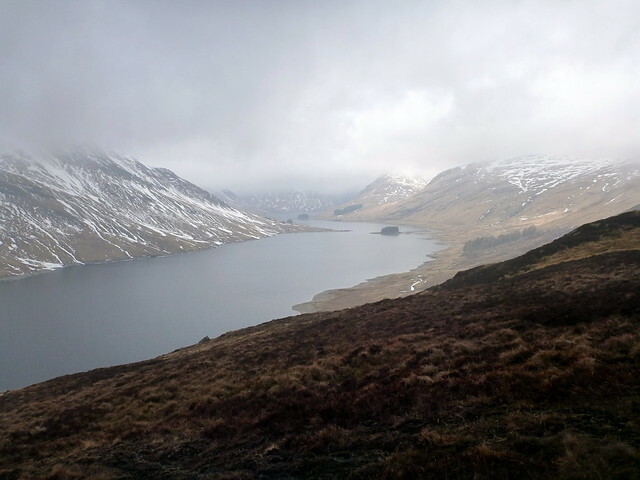 So it was a pleasant drive up Glen Lyon marred only by mist covering all the surrounding scenery. At least the road was clear of snow & ice. Spring seemed to have sprung – flowers out in the hedgerows, lambs in the fields and brown hares – having shed their winter whites – lolloping across in front of us. 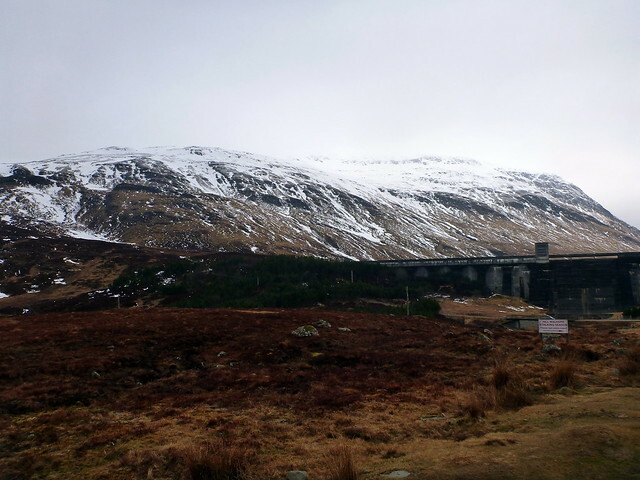 The road after Bridge of Balgie gets narrower, but there was little traffic and we parked up in the small area before Giorra Dam at just after 8. 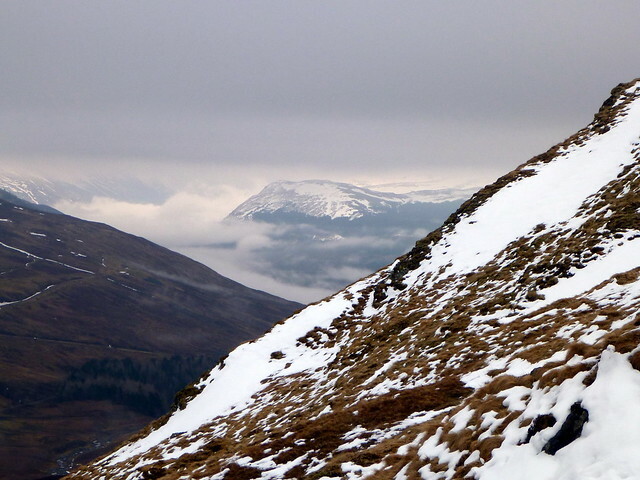 Stuckd was going to be first to be tackled – looked like it was going to be a day of limited views as a veil of cloud was lying along the top of Stuckd. 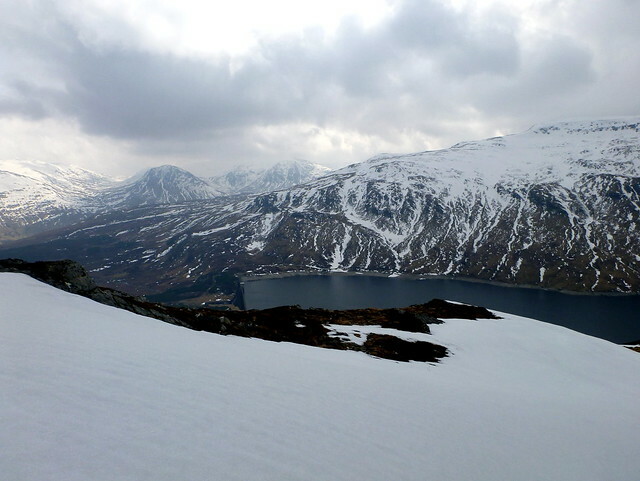 Walking up the track from the car, turning up at the small cairn into a mix of wet snow and heather, we climbed steadily up the flank of Stuckd with some nice views over the Lochan and back towards the East. 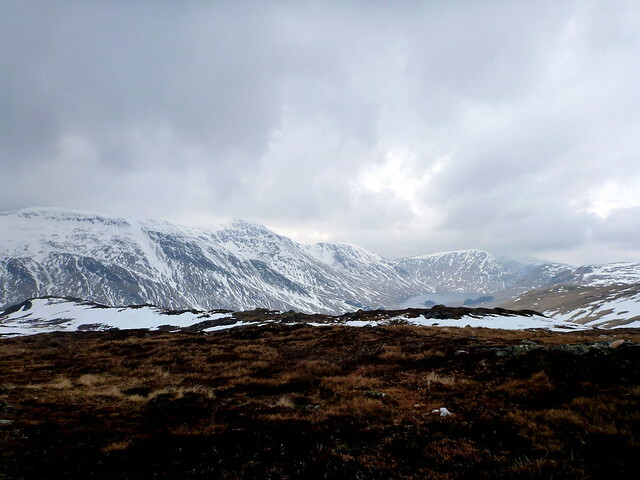 Got back to the car after 3 and a quarter hours and after stopping to release the snow (from aforesaid bum slides) from various areas of clothing and re-arrange trouserlegs we set off up Meall Buidhe. 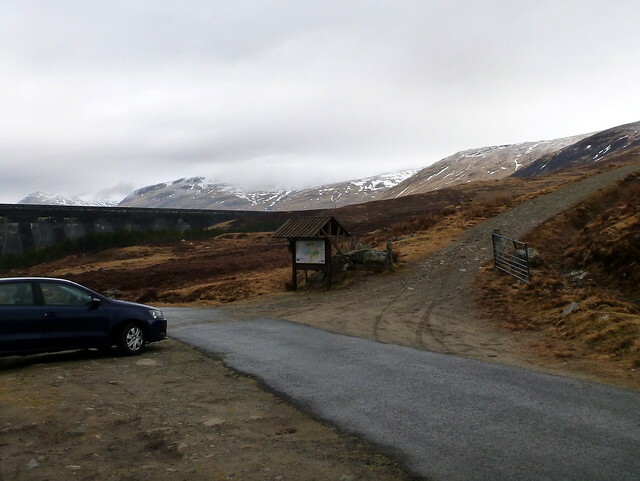 There were 3 other cars in the parking area by this time, but we didn’t see anyone else summit Buidhe – maybe they were off Corbetting. 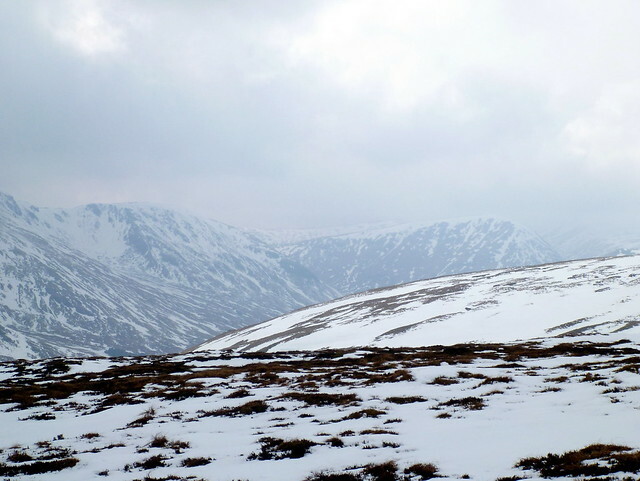 There was much less snow on the slopes of Buidhe than on Stuckd. 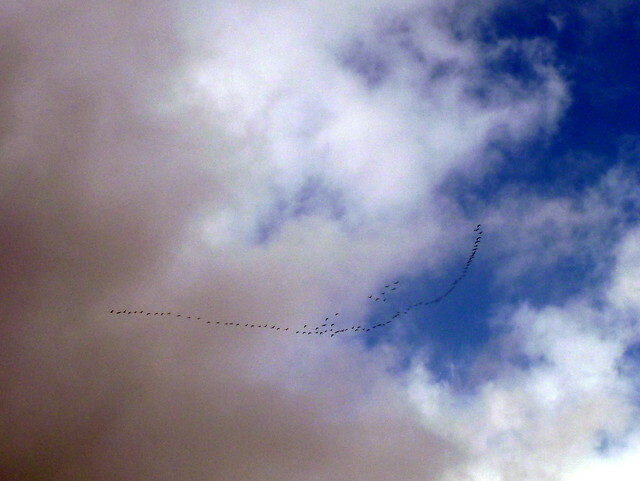 As we wandered up this gentle rounded beautiful hill we saw a large ”arrow” of geese heading along Lochan na Daimh. After a couple of hundred metres we stopped for a bite to eat and were treated to a display of tumbling by a pair of ravens just overhead – the male turning over onto his back and falling like a stone before righting his position and flapping out of the dive. We also heard the mewing of a raptor of some sort, but couldn’t see the bird through the cloud. 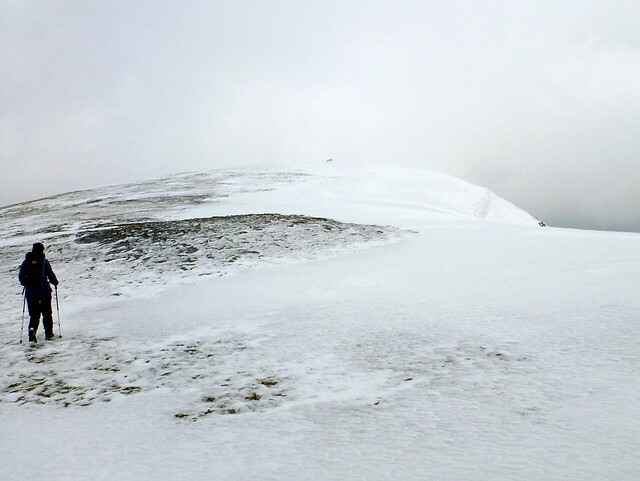 We eventually reached the snow line and headed up to the summit cairn, with the sun teasing us – would we get a view? Not at the top. However, it was Allison’s 50th and that was reason for celebration. 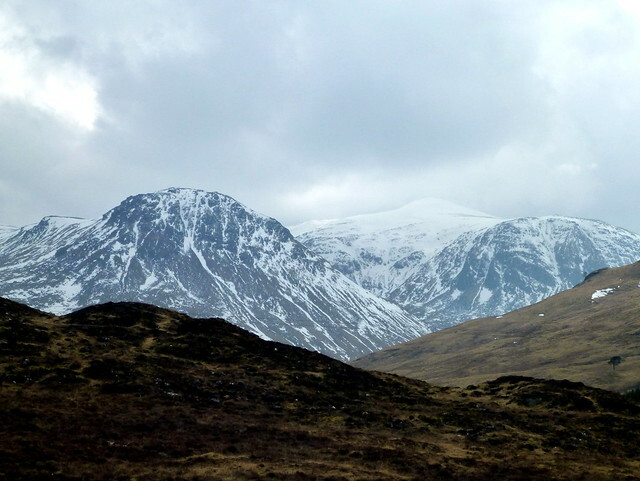 and- even more impressively, the large buttress to the North of Meall Geordaigh and Beinn nan Oighreag. By this time the sun was out in full and it was a very pleasant romp down towards the car. The grass was noticeably greener, new growth evident in the mosses and – despite the lingering snow – spring seems to be coming along. There was no sign of the 50mph gales that were meant to be battering us by this time, nor of storm clouds up above, and I felt a little cheated out of a camping overnighter and more tops tomorrow, but it was a lovely, largely effort free day and we stopped for a celebratory pint of Thrappledowser in the Lawers hotel. Well done Allison on your 50th! mrssanta wrote: Well done Allison on your 50th! Well done on a nice wee walk. 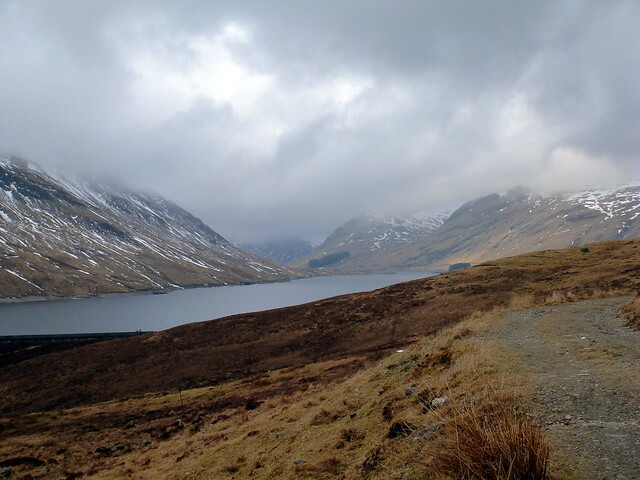 Some super photos there, too...very atmospheric. 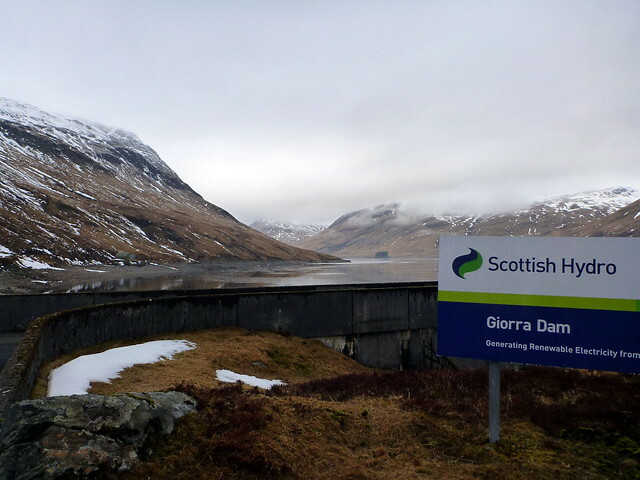 I hope to try these two this coming weekend (11-12 Jan 2014) ....I like walk-reports with photos of the start point!